To become the gold standard for regenerative organic agriculture through our state-of-the-art facilities, research and development, community, and employment initiatives. Pocono Organics is a non-GMO, organic farm that utilizes regenerative agricultural practices on a 50-acre parcel of land in Long Pond, PA.
Standards. The building will be used for growing, cleaning, processing, packaging, and storing organic crops including fruit, vegetables, herbs, and flowers. This state-of-the-art “barn” will have a living, vegetative roof which we will capture the rain water and re-use and recycle this water to be utilized for growing the crops. During Phase 1, we will construct 35,000 square feet of greenhouses connected to the barn to further help expedite the process from growing to processing during all seasons. In addition, an organic farmer’s market will be created with the sole purpose of allowing the community to visit the farm, participate in seasonal organic farming programs and purchase organic food all year round. To reduce our environmental footprint, we will connect to the Pocono Raceway’s existing 3MW – 25 acre Solar Farm, utilizing solar energy to alleviate any additional burden on the local electrical grid. Our goal is to be as self-sustainable as possible. Steps to ensure this also include installing wells and septic systems as well as collecting the water from the vegetative roof and creating a robust composting program to recycle, reuse, and sell our waste in commercially reasonable formats. Pocono Organics has partnered with Rodale Institute, pioneers and industry leaders in organic and regenerative farming practices and research. Part of our community impact plan is to develop 100+ employment positions, with a large percentage going to veterans through our unique collaboration with Rodale Institute in creating the Veteran Farmer Training Program. Rodale Institute, in partnership with Pocono Organics, will expand its Veteran Farmer Training Program to train even more military veterans at our location. This program will enable aspiring farmers to train for eight months under the leadership of Rodale Institute staff and will help veterans transition into careers within the regenerative organic agriculture industry upon completion of the program. With more than 36,000 veterans in Monroe and Luzerne counties alone, we believe this program will have a truly beneficial impact on our local area. As another means of incorporating the community with Pocono Organics, in Phase 2 we will build an additional large greenhouse that will be utilized as a beautiful event space to host weddings, special events, health and wellness festivities, yoga retreats, as well as serve as an agritourism destination. During the warmer months, we will focus on harvesting outdoor growing areas for field crops such as pumpkins, tomatoes, spinach, garlic, etc., and hold seasonal festivals (such as Pumpkin Fest in October as well as Garlic Fest) that are open to the local residents and create a sense of community while also providing education on the health and wellness benefits of incorporating local, organic food into your daily life. During Phase 2 and 3, we will continue to expand our greenhouses up to a total 250,000 square feet of growing space. Pocono Organics will also include an area for beekeeping as well as enhance the capabilities of the farm to include a small amount of animals such as chickens, all within the rubric of the gold standard of regenerative, sustainable and organic requirements. Cultivating a Vision of the Future. Pocono Organics is the vision of Ashley Walsh, granddaughter of Doctors Joe and Rose Mattioli who founded and built Pocono Raceway. Her dream was to create a non-GMO Regenerative Organic Farm that would have a significant, positive impact on local and global scales by becoming a source of healthy food options as well as an educational hub to advance the efforts of Regenerative Organic Farming. Ashley’s personal experiences led her to investigate the health benefits of an organic diet, which she soon adopted into her own life – and she quickly saw and felt the difference. Founded in 2015, Pocono Organics will not only produce high-quality produce, compost, and soil, but also serve as a hands-on and virtual learning center for best-in-class organic farming techniques for current and future farmers as well as an educational and experiential hub our community. Pocono Organics also has a broader view of what sustainable should really mean! Together with Rodale Institute, our vision is to turn Pocono Organics into a model sustainable and regenerative organic farm. Our main, state-of-the-art building, The Barn, has been designed to LEED standards and will reclaim rain water captured by our 30,000-square-foot living, vegetative roof. The farm was intentionally designed to draw power from the 3MW solar farm that powers Pocono Raceway, reclaim rain water, use regenerative soil and composting practices, draw its own well water, and expel sewage through its own sewer and septic system. Pocono Organics is one of only a few, if not the only, fully sustainable organic farms in North America. These purpose-built, environmental-minded practices have led organic farming industry leaders to say that Pocono Organics is a world-class beacon for how future sustainable farms should be designed! PA is No.2 in U.S.
Sustainability will be at the heart of Pocono Organics’ efforts. Through Regenerative Organic Agriculture practices, we will minimize our environmental impact while maximizing health and wellness offerings to our community, employees, customers, and industry. There is no substitute for getting your hands dirty! Pocono Organics will create a range of hands-on education initiatives ranging from youth to professional farmers. There will also be areas dedicated to R&D efforts in order to enhance existing practices and create next-generation farming techniques. A beautiful event venue will provide a high-end, yet rustic location for weddings, receptions, corporate affairs as well as a destination for agritourism and health and wellness retreats. Supply local, healthy food to our neighbors and serve as an employment hub for in a low-income community while delivering hope, inspiration, and happiness through school programs and donating a portion of profits to local charities. Pocono Organics will also create the first Farm-to-Track initiative where non-GMO organic food options will be provided to the 250,000+ fans attending events at Pocono Raceway. The track and farm will also create a closed-loop sustainability program where track food waste will be turned into compost. Pocono Organics, in partnership with Rodale Institute, will offer a Veterans Farming Training program to offer post-service career opportunities to veterans persuing new careers in organic agriculture. Pocono Organics will is committed to actively finding ways to continue to serve those who served us! Pocono Organics will live on 50 acres of land and be comprised of four core facilities. The Barn will be connected to 35,000 square feet of greenhouses to support and expedite crop growing and processing in all seasons. We will also have field crops throughout the property for growing during warmer months. There will also be an organic farm market for the general public and fans attending the numerous racing events at Pocono Raceway, to buy crops and attend educational, hands-on workshops. We will also build a premiere venue to host weddings, corporate, educational, agro-tourism, and wellness events. Pocono Organics will also provide employment and education opportunities for the local Monroe County community and schools while delivering organic food options to local and regional customers, restaurants, veteran’s hospitals, and grocery stores. "Organics is not a fad. It has been a long-established practice - much more firmly grounded than the current chemical flair. Present agricultural practices are leading us downhill." Pocono Organics has established a strategic partnership with Rodale Institute - the world-renown leader in Regenerative Organic Agriculture. Rich History: For 70 years, Rodale Institute has been researching innovative techniques to manage pests and diseases in organic agriculture on its 333-acre farm while providing nutritious food and adapting to and mitigating climate change. Partnership Resources: Rodale’s resources, knowledge, and techniques will be integrated into every aspect of Pocono Organics’ business – from staffing an on-site manager, staff training and soil management, to compost sustainability and marketing initiatives. Next-Generation Farmer: Veterans are a vital group to train as the current farmer population is aging and the demand for organic products continues to grow. Rodale Institute and Pocono Organics recognize this need and will offer dynamic, hands-on Veteran Farmer Training Program specifically to pass on the knowledge and skills of organic agriculture and research. Pocono Raceway was built to be different. The family run facility is still an independently owned race track and hosts five professional motorsports events, drawing more than 250,000 fans from around the world. 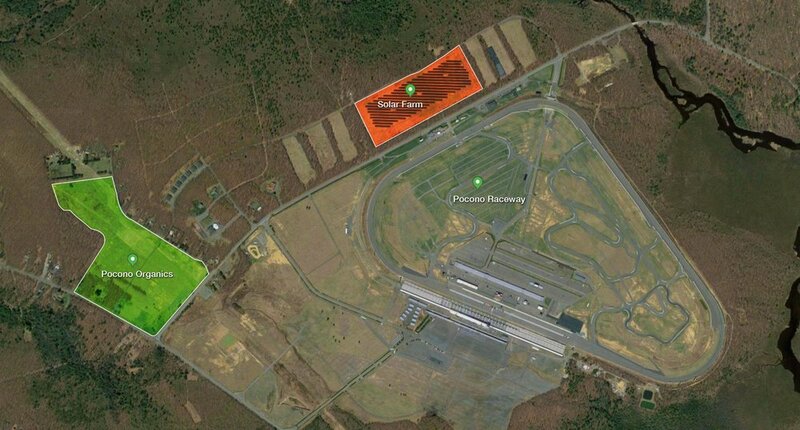 Sustainability: Pocono Raceway is able to run 100% of the facility with the power produced from a 25-acre 3MW (megawatts) solar farm as well as offset all the additional power needs required by NASCAR during an event and additionally produce enough power to support 1,000 homes. Regenerative Compost & Soil: Pocono Organics and Pocono Raceway will initiate a Farm to Track program for food and biodegradable waste during race weekends to create a regenerative compost and soil program to grow vegetables that will be then served to race fans at future events.